I have literally retyped this blog a MILLION times. I am sticking with this draft and hitting publish when I’m done, with no apologies! After shooting going on 60 weddings, I have had a lot of experience with my share of ceremony and church rules that have varied from the delightful “shoot wherever you want as much as you want!” to the ones where I walk in the room with a camera in my hand, and someone I don’t even know linebacker rushes me to start barking rules and orders to me, like I’m a little kid with a point and shoot. Or like the one priest who just told me in front of my husband that I was going to be struck by lightening because I wanted to stand in the front (WHERE IT MAKES SENSE) and shoot the bride coming down the aisle. Yep folks, this happens. I have been disrespected, called out in the middle of a ceremony for something I was told I was ALLOWED to do but the angry minister had a change of heart apparently during his preaching, causing a horribly rude scene in front of the guests during the poor couple’s wedding (which he later tried to make up for with friendly jokes and banter…and no one laughed) and I have been called “camera lady”, “hey you” and all kinds of lovely things instead of being properly introduced and respected like an adult who was hired professionally. I know I look young, and I’m short, but my clients make an investment for an experience so that I can do my best capturing this big moment…and instead of jumping to conclusions, I wish these churches/ceremony sites would respect their bride and groom and allow me to do my job properly like they deserve..the only people they are taking away from is the couple when they choose to restrict me so intensely. Client education ahead of time (I’m learning this and incorporating it into my new wedding welcome information) is KEY. Tell your clients they need to speak specifically about the rules and stipulations with the venue/church/ceremony site ahead of time and ask what the rules are for photographers. If there are restrictions, explain WHAT that means for their image results based on the info you have. If you’re not allowed to stand in the front of the church/venue when the bride walks down the aisle, which I’m sorry but that’s the only place to ME that makes total sense to capture that moment, explain to them what that means and they can expect. This is part of my new client experience and education I’ll be sharing with my couples next year as I have been through a lot of restrictions this year! Ask your clients to speak to the venue/church about restrictions, and tell them to explain their investment in photography to these people running the show that it is very important to them and ask them to make exceptions. There is nothing wrong with suggesting to them to tell the person telling them about these restrictions that they NEED their photographer in the front of the church/venue when the bride walks down the aisle, etc. There are certain shots that are impossible without certain placement. Additionally, churches and venues do not have the right to require you to attend rehearsals. I got a contract..yes, a contract from a venue this year and it was apparent they had never had a professional photographer at their venue before based on their stipulations. At some point, some family member or friend with a camera really killed it for everyone else because they wanted my giant pregnant belly to stand behind a BEAM or “pole” as the lady called it to shoot the bride entering and the ceremony. I did not have the time to explain to the lady about lighting, my 35mm vs my 70-200mm – the brown beams and the off white ceiling, the backlit entrance with daylight streaming in behind the bride..but I told her that I would most definitely inform the bride that her images are directly effected by these nonsense (there, I said it) rules they had for me. This venue also “required” that I attend the rehearsal, but I had to attach a letter to them explaining this was an unrealistic expectation for many reasons. The clients didn’t book me for a rehearsal is #1, the church is not providing me mileage pay for driving there and additionally it is not a vendor responsibility to attend one. I had a wedding on that date anyway and in NO way offense to my clients, because they are my dolls and I love them..but I will not be able to take time from my business and family to attend a rehearsal when I will be at the venue the very next day in the light setting that I will be actually working in so it makes more sense for me to assess the situation in it’s proper element on the actual day. In closing..please, know this comes from the biggest place in my heart where I protect and serve my clients with a fiery spirit. When a venue tells my couple they will be shorted in their experience because of these antiquated and most of the time completely illogical rules they have set just to set them for control sake, it makes me so disappointed but I WILL tell you that I do my absolute BEST to work around it. I DO have wonderful ceremony images from strict ceremonies because as a photographer, you make it your own and work with what you have. I have a $2400 zoom lens that looks like a weapon/light saber and I can get some pretty amazing shots with it despite being really far back. I’m talking simply today about the rules that don’t seem to serve a purpose when it comes to the actual religion or venue, but are just set to be strict because of some experience they had with another vendor. My camera shutter AND beep is able to be silenced and I wear quiet shoes, and I’m literally hardly 5 feet tall…I CAN be discrete! Look at these amazing images below from a recent ceremony that allowed me FREEDOM. 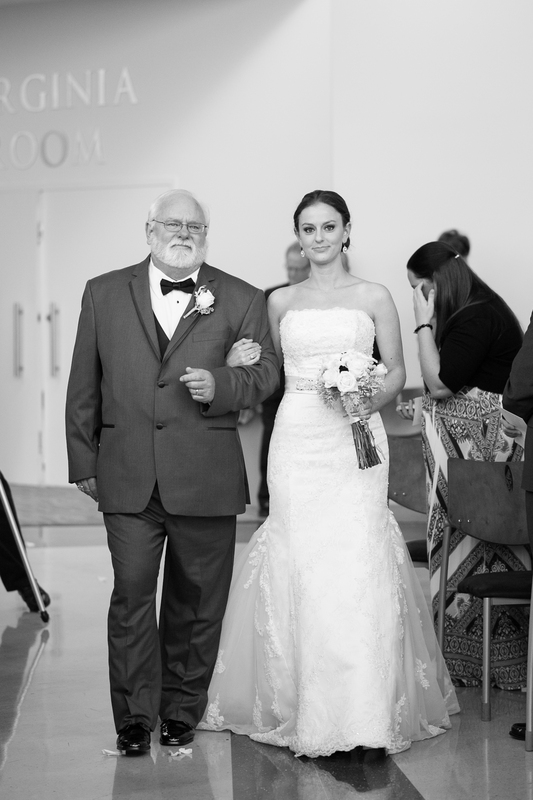 I adored the man residing over the ceremony for not only allowing this but for being so invested in preaching and not paying attention to what I was doing, the way it should be 🙂 I love these moments of Morgan and her dad, walked down the aisle, given away with a hug and holding hands. My heart is melting! hahahaha this is the best comment ever!!!!!!!!!! :) thank you!